best damn thai food in berlin. seriously. edd’s thailändisches restaurant? please. mao thai? no way, josé. nope — for the freshest, most delicious, and authentic thai food, head on over to winterfeldtmarkt on saturdays, and find the little stand owned by the talented and lovely ms. rattaporn moeckel. choose any of their daily specialties. you’ll love it, regardless of what you end up ordering — be it soups, curries, or chicken saté. their wonton soup is made with delicate, pillowy wontons stuffed with ground pork and spices, bobbing around in a flavorful broth. 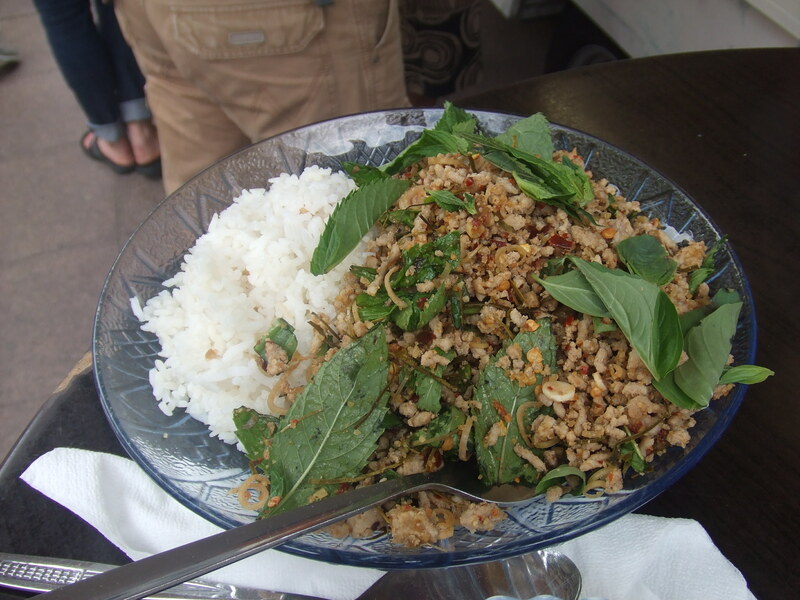 larb -- spicy ground pork salad. my personal favorite by far, however, is their fiery dim sum. people with “farang” palates can get a whimpier version, but really – what’s the point? 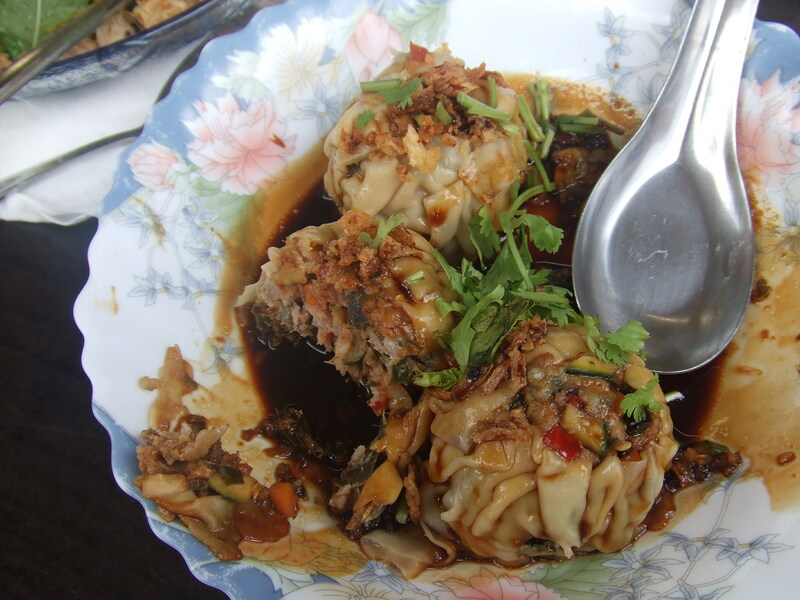 these are incredibly delicious dumplings bursting with thai flavors: spicy, salty, sour, and a touch of sweetness. dim sum = delightfully sumptuous. 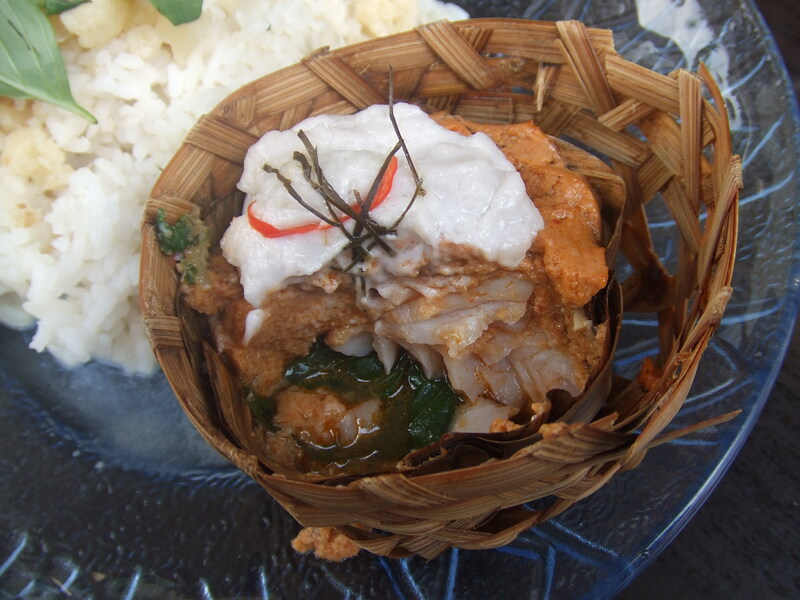 a recent special was this incredible steamed fish topped with a custardy coconut curry. a basket full of happiness. ms. moeckel can be hired for catering, and if i were to throw a party in berlin, she’d be my first choice. go eat there NOW. do make sure to get there before 1 pm, otherwise most of the tasty treats will have been ravished by other, earlier birds. damn, i hate those early birds. mein absoluter lieblingsmarkt. hier habe ich mich im frühjahr regelmäßig mit tagesfrischem, elfenbeinern-schimmernden spargel eingedeckt. seit einer ganzen weile gibt es dort auch den steckerlfisch-stand, bemannt von einem wahnsinnig freundlichen bayern und zwei wechselnden, ebenso freundlichen jungs. ganze makrele, forelle, dorade, mit kräutern gefüllter tintenfisch, für den kleineren appetit auch ‘nur’ filets kommen dort gut gewürzt auf den grill – seitdem mein stamm-mittagessen mittwochs & samstags. der thai-stand für die leckeren und scharfen dumplings & die aromatische wonton-suppe. patisserie lautz – kleine, delikate moussetörtchen, wenn man wie ich zu faul für die eigene dessertherstellung ist. kaaswinkel für freundliche beratung in sachen käse & viele probiermöglichkeiten. vorkauf – für die pariser edelpastete, vitello tonnato & die mozzarellaröllchen und das landbrot. fazit: frühstück, brunch & food-shopping fürs wochenende in einem.